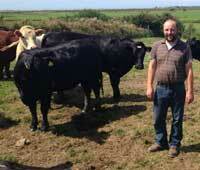 Dewie Evans, Sheep and Beef Farmer, Anglesey, Wales. With over one thousand sheep, and with several hundred cattle, I have to get things right first time. I use Bimectin Plus, Bimectin Injection and Bimectin Pour On to cover all my cattle’s parasite control and treatment needs. Bimectin and my quad…these are the two things I cannot work without.